We rarely meet a cheesy potato bake we don't like. But this one, festooned with thin slices of tomato, is as good looking as it is delicious! Arrange tomatoes alternately with potatoes in concentric circles in 9-inch pie plate sprayed with cooking spray, overlapping slices and rows as needed to form even layer. Drizzle with dressing; sprinkle with cheeses. Cover. Bake 1 hour or until potatoes are tender and Parmesan is lightly browned, uncovering for the last 10 min. Let stand 5 min. before unmolding onto plate. 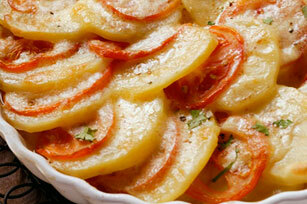 When thinly slicing a large amount of potatoes, use a food processor or manual slicer (mandoline) for even results. Place the sliced potatoes into a bowl of cold water until ready to cook to prevent them from darkening. To easily slice a tomato, hold tomato so that the stem end faces out. Cut a thin slice off the stem end with a sharp chef's knife or serrated knife. Discard the trimmed end. Cut the tomato into slices of the desired thickness. Tomatoes cut this way will keep their juice better than those sliced vertically (from top to bottom).